We’re still sizzlin’ this summer! A man disappears from home leaving his family and the police to search for him, an echidna leaves its forest braving the world beyond and look for a mate, scientists are trying to build a cosmic elevator, while a satellite oversees everything and everybody on Earth. All are on the verge of evolutionary dead-ends, and all are striving to exist. How does one overcome extinction, and what lies beyond if you survive? Limited Seating- RESERVE YOUR TICKETS NOW! https://singlecarrot.com/wp-content/uploads/2017/08/logo-300x300.jpg 0 0 Alix Fenhagen https://singlecarrot.com/wp-content/uploads/2017/08/logo-300x300.jpg Alix Fenhagen2013-07-25 18:02:002018-08-22 19:08:56We're still sizzlin' this summer! About The Show: Join magician David London on a journey to someplace else. Featuring highlights from David’s previous theatrical productions, including Cerebral Sorcery, …Art of Dreams, and The Adventure to the Imagi Nation, this full-length performance is packed full of laughs, mystery, and the unexpected! The show is 90 minutes in length and recommended for ages 16 and above. 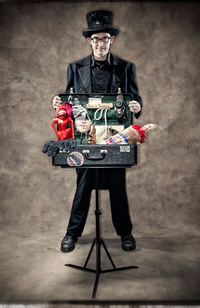 About David London: David London combines magic with storytelling, puppetry, comedy, philosophy and that which cannot be defined to create original shows of magic unlike you have ever experienced before. David discovered that he was a magician at the age of seven. In his over 20 quest to understand just what that means, he had created five original theatrical magic productions, as well authored eight manuscripts related to magic and illusion. David regularly performs his unique style of magic at theaters, museums, galleries, festivals, and private events, and has presented his shows, workshops and lectures in over 1/3 of the United States.